There may still be four months to go for residents to vote in the local authority elections, but one party's already launched its campaign. Labour have released their top five priorities which they hope will lead them back into power on May 22nd. 3. Install new CCTV, alley gates and street lighting in crime hotspots. 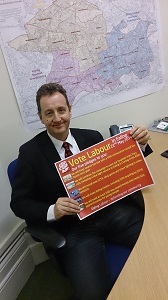 “This pledge card is a simple and clear indication of what a Labour council will mean for residents of the borough. We will build on our achievements of the last 4 years, delivering a council tax freeze for the fifth consecutive year, continuing the fight to save our hospitals and addressing the key residents’ concerns of tackling crime, keeping the borough clean, protecting the environment, investing in young people and delivering more affordable homes.